The heavy duty coiled hose will not harm animals while bathing. T&S Brass delivers the finest in craftsmanship and service. This unit is constructed from the finest materials, carefully inspected and undergo rigorous testing to ensure their durability and quality. Professional Spray Hoses save time & money with a more powerful, concentrated stream of water. Features angled spray valves and one-hand operation with slip rings. 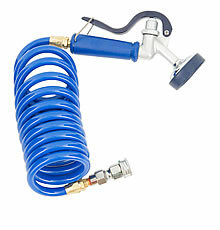 Coiled Sprayer has heavy - duty polyurethane hose with maximum stretch length of 9 feet. This sprayer can be used for home use. Use in your kitchen, bathroom or outdoors. 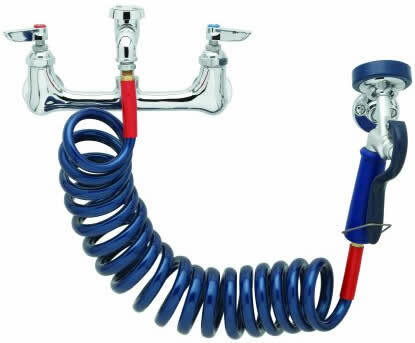 Can be hooked up to a kitchen faucet, bathroom faucet, wash tub or outdoor faucet. 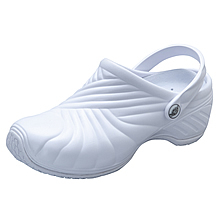 You will need to know the size of you faucet end to be able to choose the correct faucet type option above. You have a 1/2" male inlet. You will choose adapter option 1/2" female garden hose inlet PG-35AV-CH01 or 1/2" NPT female inlet PG-35AV-CH03. You have a 3/4" male inlet w/14 threads per inch. You will choose adapter option 3/4" x 14 female inlet PG-35AV-CH05. You have a 3/8" male inlet. Choose adapter option 3/8" NPT female inlet PG-35AV-CH02. Adapter options are available for converting the sprayer hose end to your faucet type.